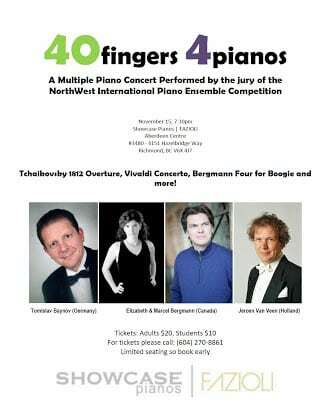 European Pianos in Vancouver | A Concert with 40 Fingers on 4 Pianos! 30 Oct A Concert with 40 Fingers on 4 Pianos! RICHMOND, BC – The jury of the upcoming NorthWest International Piano Ensemble Competition will come to Showcase Pianos + Academy in Aberdeen Centre to perform great favourites such as Tchaikovsky’s 1812 Overture, Vivaldi Concerto, Bergmann Four for Boogie and more! Performers include Tomislav Baynov from Germany, Jeroen Van Veen from Netherlands, and local Canadian Duo Elizabeth & Marcel Bergmann!